Pedro has pastured this church since 2001. He has a vast knowledge of the Bible and is able to communicate many truths clearly to his people. 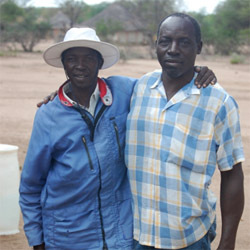 With his wife’s long illness and her death in May in 2012 Pedro did not attend teaching regularly as he often would take his wife to the hospital which is over 100km away. The church also suffered because of his absence. Last year Jeremiah, who is quite cripple in one leg, came to lead the church alongside of Pedro. Jeremiah left his previous church as they didn’t see eye to eye with him after he came under our teaching. He is an encourager even after his one young son died around the same time as Pedro’s wife and will be of much benefit to the church and to Pedro. Pray that these men will make a difference in Panhame for Christ and that the church will be a “light on a hill” in the community.